Telecom Argentina is an Argentine communications service provider (CSP). As a result of the recent merger with Cablevisión Argentina, Telecom Argentina is now positioned to be the first quadruple-play company in the country, providing broadband, pay TV, fixed line, and wireless services. With over $6.4B in revenues (last twelve months ending in Q1’18) and a market capitalization of close to $7.5B (Q3’18), the company boasts the number one share in Argentina for pay TV and broadband access, with 38% and 57% market share respectively. The company is experiencing rapid growth in numerous areas. Q1’18 revenues were up 27% year-over-year. 4G subscriber growth was a whopping 61% year-over-year. Year-over-year data usage grew 59% to 2,256 MBOU (MB of usage). In response to this tremendous growth, which has brought their current subscriber count in Argentina to 30.8 million, Telecom Argentina is taking future investments seriously. The company is defining their digital transformation strategy to include networking architecture and technologies, convergent systems and services, and cultural transformation, allocating $5 billion in capital expenditures to support the transition. Network traffic is growing exponentially. Just in the period from 2018–2020, the number of connected devices world-wide is expected to jump from 30.8 billion to 50.1 billion through IoT devices. During the same time-frame, the bandwidth used around the world is expected to jump from 600Tbps (terabits per second) to 1.1Ebps (exabits per second). This dramatic growth is driving CSPs such as Telecom Argentina to re-evaluate how they think about their networks in a fundamental way. The below diagram shows the rethinking along a number of dimensions. At the same time, costs, being proportional to network traffic, are going up exponentially, while revenues are climbing only linearly. This creates a gap that can only be bridged by new technology focused on utilizing greater flexibility, programmability, automation, openness, and interoperability. The focus of this case study is on SDN technology that introduces a new, purely software, architectural approach. Telecom Argentina found SDN’s ability to separate the control plane of network elements from the data plane and then centralize the control plane onto a series of controllers useful for their transformation efforts. SDN promises flexibility, programmability, automation, openness, improved interoperability, and disaggregation of functionality. Despite potentially inhibiting factors such as market confusion, numerous reference architectures and ways to segment a platform, there is tremendous industry momentum around SDN. After weighing the various trade-offs, Telecom Argentina felt that SDN was worth adopting. The Telecom Argentina team further believes that open source is a valuable consideration in the overall digital transformation context, given their mix-and-match architectural approach. The team concluded that the most important benefit of open source is the rapid innovation cycle within communities that directly contributes to a quicker time-to-market rollout of new services for CSPs. The architecture team at Telecom Argentina evaluated several open source SDN projects and selected OpenDaylight for their initial work. The main factor in OpenDaylight’s favor was its platform flexibility, providing a rich spectrum of use cases. OpenDaylight is applicable to a large number of use cases including CDN, IoT, video content, multi-access edge computing (MEC), augmented reality/virtual reality, and cloud computing. Telecom Argentina made two key decisions as it started to work with OpenDaylight. First, the team decided to start with one use case but “think big” in terms of a future-proof architecture; several additional use cases are planned for subsequent phases. In certain paradigm changes, the added value comes from the incremental value accumulated over several use cases because the killer application is the new paradigm itself. In this particular case, SDN is preparing Telecom Argentina for 5G. Second, the team chose a use case that was able to demonstrate concrete improvements and clear business value by itself. This specific use case would also allow learnings that could be used for subsequent use cases and provide valuable feedback to the overall strategy definition. CDN is particularly attractive as an initial use case given the tremendous value of CDN and that it is already in production. Given that the majority of the traffic through Telecom Argentina’s network is a combination of video and web collaboration accessed across the vast 3,650 Km. length of the country, moving this content closer to users improves both user experience and reduces data transport costs. CDNs are expected to increase in numbers and get closer to subscribers with edge computing and 5G around the corner. For these reasons, it was logical to try SDN with the CDN. CDN traffic routing can be optimized and configured through BGP announcements. The configurations can change customer to CDN assignment to reduce the delay and transport capacity needed, and over time, reduce Internet ingress traffic and introduce traffic granularity, multi-domain architecture and integration with telemetry and analytics. 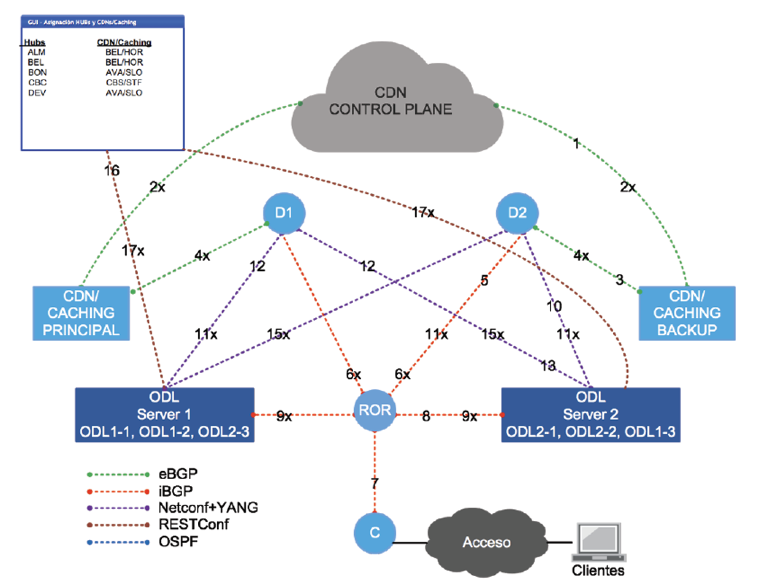 However, without an SDN controller, all of this configuration had to be done manually. To make matters worse, there is no single tool to do this type of configuration. The various different tools are ad-hoc with duplication in areas such as performance, security, and others. With more than several million subscribers and several hundred hubs with CDNs, manual configuration simply was not an option. The result of not being able to change configurations was inflexible and static CDN traffic routing. Telecom Argentina concluded they could overcome these limitations by using OpenDaylight with CDNs. With the help of Inocybe (now part of Kontron), Telecom Argentina deployed an OpenDaylight application that could dynamically configure how traffic was served through BGP announcements. Using this application, it is now possible to mix and match subscribers to CDNs, resulting in tremendous flexibility. 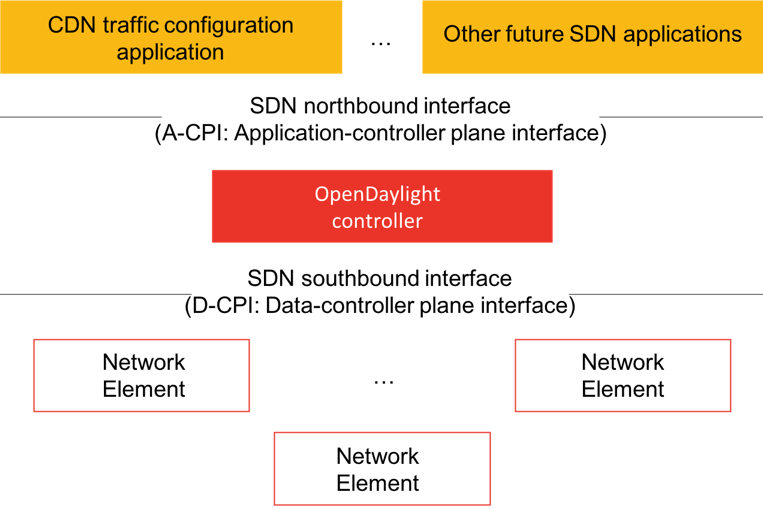 The application was written on top of OpenDaylight’s northbound interface, which is designed in a manner consistent to ONF TR-502 SDN Architecture. The resulting CDN + SDN architecture is shown in the two below figures. Telecom Argentina has provided valuable feedback to the OpenDaylight community about the challenges they faced in the areas of clustering and geo-redundancy, maintenance of configuration state and log options, load balancing among cluster members, and PCE open-source. The team plans to analyze and provide feedback on the version upgrade process, telemetry, and interaction with analytics tools and controllers ecosystem for new use cases (further details shown in ONS Europe 2018 presentation). Telecom Argentina has found it very effective to start simply, with an ambitious future-proof architecture to evolve to further use cases, to fail fast/adopt quickly, and to scale. The team has learned that SDN is a very useful technology in the overall digital transformation effort. It enables very complex use cases that were previously almost impossible, while also saving CAPEX and OPEX. They better understand the different tradeoffs between the entire spectrum of technologies from open source components from integrators to open packaged components to proprietary components in terms of interoperability, flexibility, programmability, automation, disaggregation, innovation cycles, cost optimizations, and several other non-technical aspects. SDN has a bright future at Telecom Argentina with additional use cases planned to take advantage of the technology.